Part of why change is so hard is because we humans exist within a culture. Culture isn't something you wear to work. It's really the essence of who you are in the community you are working within. So as you're thinking about change and change management, you need to understand what your challenges are going to be and what the culture is that you're going to be working with. I urge you to take a look at the ocai-online.com. The OCAI is a very insightful survey that was developed at the University of Michigan by Dr. Kim Cameron and Dr. Robert Rubin. It's an excellent tool to understand the culture you have today and what you would prefer it to be or to become in the future, and it really helps you graphically see what you're dealing with in your business, culture-wise. It is very interesting when you do the OCAI because it asks you what type of culture you really want, and what that really means. Do you want to be more collaborative and more innovative, or more hierarchical, rules-driven and competitive? The OCAI will reveal this so that you can see where exactly you need to change. What is your company's culture anyway? 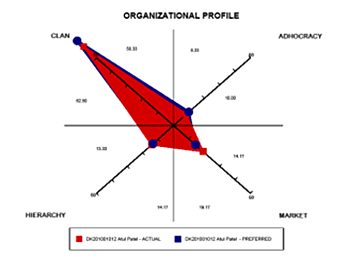 When we take a company through their OCAI, we work through the idea that there are four dominant types of organizational cultures, each with its own personality archetypes. There are the" ad-hocracies" that are creators. They're very empowered, very innovative, very entrepreneurial, and they are really quite willing to take risks and get out there. The opposite are the hierarchical controlling companies. So if the first one is very entrepreneurial, the hierarchical one might be a civil service company or a post office or a bank with a lot of top-down control and rules. Not bad, just different and at odds with each other. The other two in this four-part matrix are companies that are highly collaborative. 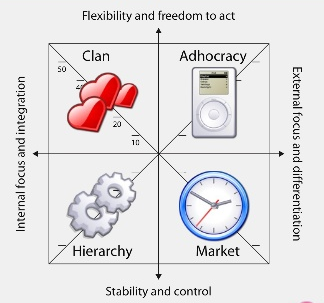 So once you take the OCAI and get your profile, you begin to realize that each type of culture helps people adapt. And remember, there is no perfect culture. But during fast-changing times like these, the wrong culture can take you down the wrong road. On top of that, like humans, organizational cultures hate change. The values, beliefs and behaviors that are recognized as “the way we do things here” reinforce continuity and consistency but can hold a company back. You're going to change your culture and the way things are done in your organization, and it's going to hurt. You'll be wanting your staff to do more of some things and less of others, and they may agree or they may resist tooth and nail. 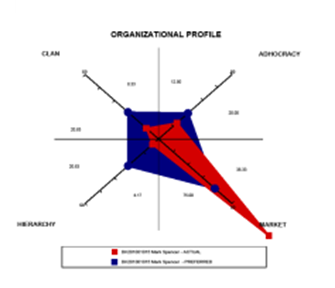 So once you take the OCAI, take a good look at what your red and blue areas are, where your culture is looking good now, and how you need things to shift. If they need to shift only a little bit, you're not off by much. But if you need a dramatic 10-point shift, it's time to change. In the third podcast in this series, I explain how to make sure that you are shifting collaboratively with your team into a new culture that's going to enable them to get their jobs done comfortably, if now differently. Please join me for this next one as we really dig into the nuts and bolts of how to bring about real, lasting.change! Podcast: Ask Andi—How Do You Change Your Culture? Podcast: Kimberly Davis—Leading Change: Are You A Brave Leader? Wondering how, and whether, to change your culture? Let's talk. In today's disruptive economy, your business needs to be able to sustain growth in changing times or you risk being left hopelessly behind. Often, the best place to start is with your culture. Is it ready to respond to the needs of the future or is it mired in the outdated ways of the past? At Simon Associates Management Consultants, we specialize in helping organizations change, grow and thrive amidst today’s fast-changing times. Please contact us. We'd like to help.